- SS3s can be spammed but must be in-line with target. Best after parry or combinattions. - A bit hard to spam, so use after parrying, while the enemy is stunned, or rely on her frame locks. - Combo Partner: [Dark Element] - Increases damage by 5% vs Holy Element. - SS3s can be spammed, just time it well. - Combo Partner: [Wind Element] - Increases damage by 5% vs Earth Element. 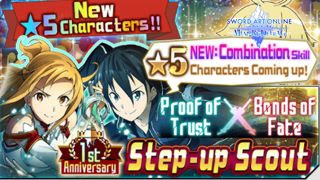 - Combo Partner: [Kirito] - Increases damage attained by 10%. - SS3s is pretty straight forward, best used after parry or for combination attacks. - Combo Partner: [Neutral] - Increases damage by 5% vs Neutral Element. - SS3s can be spammed, best with combinations. - Mostly used as a support unit, but a decent auto-aim caster after learning her new SS. - SS3s can be spammed but must be in-line with target. - Combo Partner: [Automatic Rifle] - Increases damage by 10%. - Use SS3s after parrying or while the enemy is stunned, turning off Auto-Approach will increase range but will only deal 70% damage. - Combo Partner: [Fire Element] - Increases damage by 5% vs Wind Element. - SS3s can now be spammed easily, just time it well.